Lisa's ruminations...: I have been tagged...twice! 1. I'm pretty scared of heights. My hands get really sweaty and I get really nervous(sounds more like a date:) when I'm up on a high ledge or sometimes even in airplanes. The heart rate gets really fast the higher up I go. I actually didn't go on an upside down roller coaster until my senior year of high school, because they went so high up, the smaller wooden ones were okay. 2. My best ideas come in the shower. My "Ah hah" moments are those early morning moments when nothing else is on my mind and thoughts can just come...problem being, I'm still not awake enough to remember every fantastic thought that came, but sometimes those gems make it through. 3. I LOVE horses. I never had one, didn't take riding lessons or anything, but my cousins had horses and I loved hanging out at their house during holidays, riding the horses and feeding them. When I was younger I even wanted to be a horse, I'd go galloping up and down the hallways, ruining my pants by putting holes in the knees; watch, "The Black Stallion" and "The Black Stallion Returns," just classic movies about a boy and his horse and wish I owned one...the memories. 4. 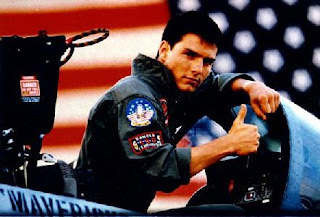 TOP GUN PHASE: In 6th grade, I wanted to be a fighter pilot. Not sure why, my best friend and I went so far as to talk about the free ride to college if we joined the Air Force. Right before graduation from high school, I even applied, interviewed and did the physical testing to get an ROTC scholarship. Got it, but didn't accept it, decided it wasn't really for me. I know surprising, can't you see me in the flight suit? 5. You may know that I am a history nerd, love it, love re-enactments, love American history type movies and books. The American Civil War is my particular focus, love it. I wanted to be Scarlett O'Hara and have the hoop skirt and huge home. I would love to be a re-enactor sometime. Weird...I know.